Which is the third party in British politics? September 14, 2016, 8:26 p.m. Which is the third party in British politics? For decades the answer was simple – the Liberals or Liberal Democrats, depending on the decade. But as party activists trudge down to Brighton this weekend, having been hammered by consecutive devastating defeats in both the general election and EU referendum, the answer is no longer clear. Newly triumphant UKIP, holding their own conference this week, the dominant SNP and even the upstart Greens all seek to humiliate the party of Gladstone further by wresting the status of third party from them. 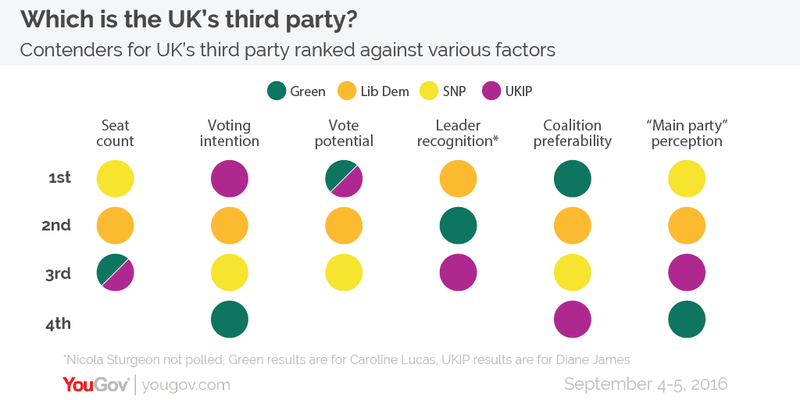 Which party has the best claim to being the UK’s third party? Let’s examine the case for each using some national data combined with new YouGov research. With just 8 MPs and 7.9% of the national vote, the successor to the once mighty Liberal party is in its worst state since the 1970 general election (when admittedly it would have been indisputably the UK’s third party). The party still benefits from the brand it developed in happier times as a big name party though. Tim Farron has received enough publicity for more than half of people to know who he is. A third of people consider the Lib Dems to be one of the “main parties”, performing well comparable to the other parties given their seat and vote shares. 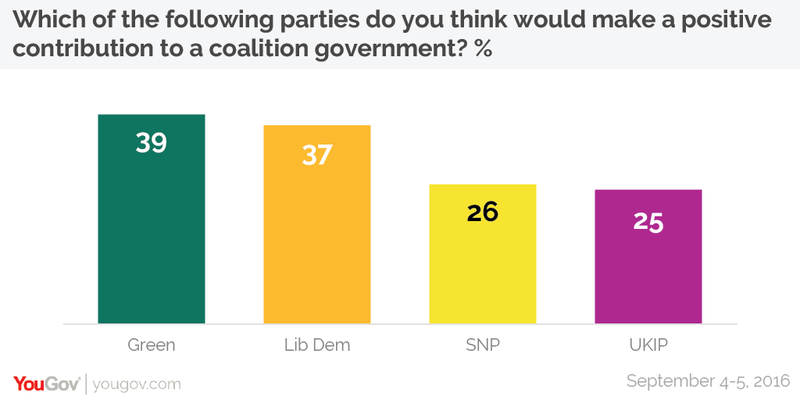 They are also one of the most desirable coalition partners, with 37% of people saying that they would be a positive influence on any coalition government. Raw seat numbers make the SNP a powerful contender – with 54 MPs they are by far the largest of the parties listed in the Commons. They are also the party most likely to be considered by people to be a “main” British party, with 36% (71% in Scotland). Their potential is limited by the fact that they are a regional party – and that their region may not be a part of the UK for much longer. Whilst we didn’t survey to what extent people would consider voting SNP, we can calculate from the size of the Scottish electorate compared to the UK electorate as a whole that the maximum vote potential for the SNP is about 8.7%. They are viewed with suspicion in coalition terms too, with 26% of people saying they would be a positive influence versus 44% of people saying they would be a negative influence (a net score of -18). UKIP are the most popular party in terms of votes. 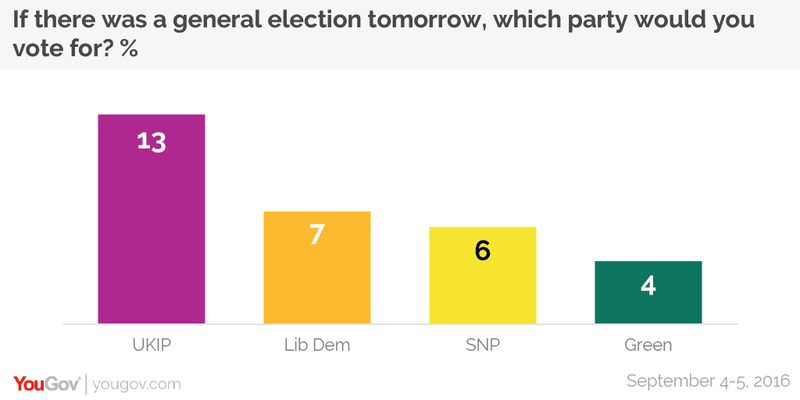 The party polled 13% in our last voting intention survey – essentially the same as their 12.7% 2015 vote share. They also have the potential to scoop up a quarter of the electorate, with 24% of people saying they would consider voting for them. UKIP are the least popular prospect for a coalition partner though, with more than half of people (51%) saying they would be a negative influence on a government. 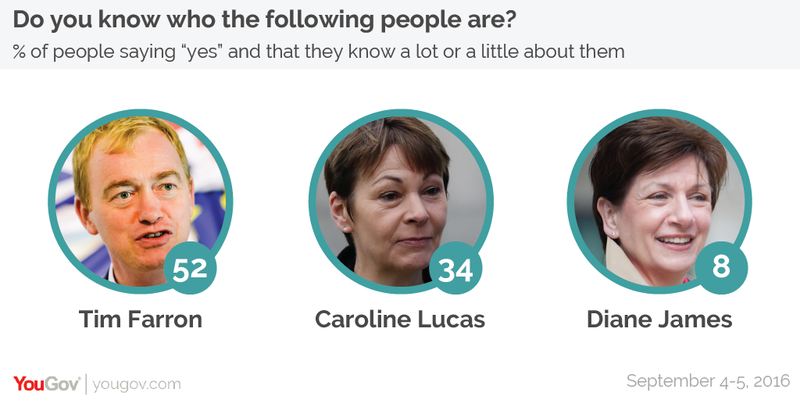 And whilst Farage is a well-known figure, his likely replacement – Diane James – is not, with just 8% of people having heard of her (including 8% of UKIP voters). The Greens are the most popular choice for a coalition partner, with 39% of people saying they would have a positive influence on a coalition government. That is of course if they allow themselves into one – somewhat optimistically, at their spring conference in 2015 Green party members passed a resolution that Green MPs would not enter into any coalition in which they did not hold the majority of MPs. 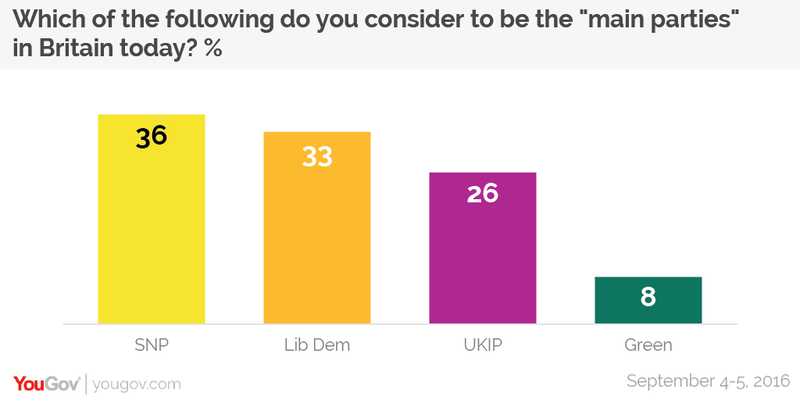 However, the Greens are the party least likely to be seen as a one of the “main” parties by the public. At just 8% they are seen as a main party by fewer than a third of the number that UKIP, the next highest party, has. A lot can happen between now and the next election. It is not clear that UKIP is going to be able to hold itself together after Brexit. Scotland might no longer be a part of the UK, and the Greens might suffer an electoral reversal given the loss of so many of their supporters to Jeremy Corbyn&apos;s Labour. Maybe the Liberal Democrats will be able to hold on to their title after all.